Signs like this one are posted up and down the northern Pacific coast of Oregon. 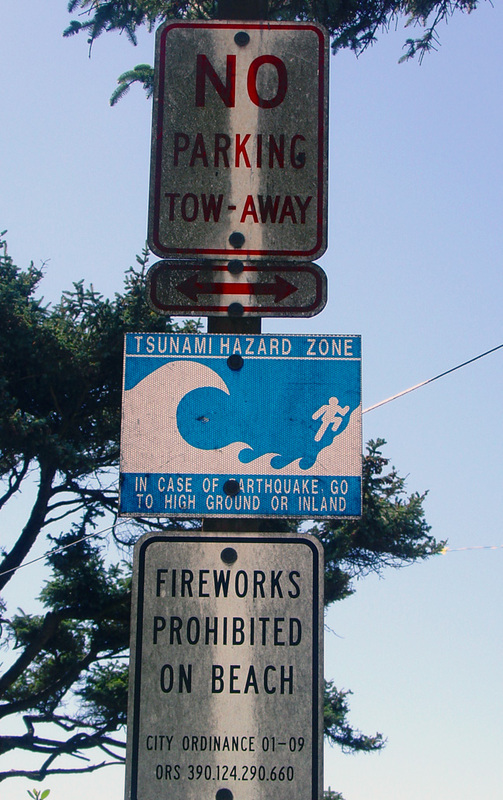 My son has a lifelong fear of tsunamis, so when I told him about the sign, he urged me to leave immediately. I knew it would freak him out. Long before I became a father, I was an older brother. It’s a hard habit to break. The little guy, running away from the big wave…doesn’t look like he’s got much of a chance, does it? P.S. Just figured out, this was my 500th post! That hardly seems possible. A team of UC Santa Barbara scientists went diving one day in 2002 in an area of the Santa Barbara Channel called Shane Seep, when the earth did something alarmingly rude, though not unexpected. She belched — a “massive blowout of methane,” that “sounded like a freight train,” as Science Blog relates the story. Atmospheric methane is 20 times more potent than carbon dioxide as a greenhouse gas, and is the most abundant organic compound in the atmosphere. The ocean floor’s release of trapped methane hydrate — a form of ice that contains a large amount of methane within its crystal structure — in bubble form is both a symptom and a cause of global warming, according to UCSB geological science professor James Kennett’s theory. Studies of seabed seep features suggest such events are common in the area of the Coal Oil Point seep field and very likely occur elsewhere.The authors explain that these results show that an important piece of the global climate puzzle may be explained by understanding bubble-plume processes during blowout events. The next important step is to measure the frequency and magnitude of these events. The UCSB seep group is working toward this goal through the development of a long-term, seep observatory in active seep areas. Very little news about this, even on the long-tailed Internet. Sure, Troms is a remote area, north of the Arctic Circle. But: It's one planet. While a meteorite landing two-thirds of a mile from a farmer in the frozen north might seem like a faraway event, something like this could happen, and a global catastrophe would be the result. If an asteroid crashes into the Earth, it is likely to splash down somewhere in the oceans that cover 70 percent of the planet's surface. Huge tsunami waves, spreading out from the impact site like the ripples from a rock tossed into a pond, would inundate heavily populated coastal areas. A computer simulation of an asteroid impact tsunami developed by scientists at the University of California, Santa Cruz, shows waves as high as 400 feet sweeping onto the Atlantic Coast of the United States. The researchers based their simulation on a real asteroid known to be on course for a close encounter with Earth eight centuries from now. Steven Ward, a researcher at the Institute of Geophysics and Planetary Physics at UCSC, and Erik Asphaug, an associate professor of Earth sciences, report their findings in the June issue of the Geophysical Journal International. March 16, 2880, is the day the asteroid known as 1950 DA, a huge rock two-thirds of a mile in diameter, is due to swing so close to Earth it could slam into the Atlantic Ocean at 38,000 miles per hour. The probability of a direct hit is pretty small, but over the long timescales of Earth's history, asteroids this size and larger have periodically hammered the planet, sometimes with calamitous effects. The so-called K/T impact, for example, ended the age of the dinosaurs 65 million years ago. "From a geologic perspective, events like this have happened many times in the past. Asteroids the size of 1950 DA have probably struck the Earth about 600 times since the age of the dinosaurs," Ward said. Here's a link to the simulation. Have a nice day! Truls Lynne Hansen of the Northern Lights Observatory (Nordlysobservatoriet) in Tromsø disputes Røed Ødegaard's description, calling it an exaggeration. "Our atmosphere is peppered with small stones from outer space all the time," Hansen told newspaper Aftenposten. "Most burn up and disappear, but some land here." He thinks that what hit northern Norway last week was a stone weighing around 12 kilos (about 26 pounds). "Out in space it generated enormous speed, but after entering our atmosphere its tempo eased," Hansen said. "This kind of meteorite isn't radioactive and it's not glowing when it hits the ground." Time to catch breath. I've blogged on far more topics than I expected to when I started this up. I have received so many kind comments, both on- and off-line. I intend to continue it indefinitely, because I love writing it. Salute to Ray Davies was prompted by the upcoming release of the longtime Kinks' leader's first solo album. I expressed nervousness about whether the CD would be good. The late Kinks albums were pretty weak. Well, the album, "Other People's Lives" is out and it's not merely good, it's great from beginning to end. It manages to capture everything fans love about Ray, and yet sound quite different from anything he's done before. That might be because, as he explains in the liner notes, his Kinks songs were written in the studio, which suggests they were written to order, on deadline, with an expensive clock running, perhaps a little slapdash. This time, Davies labored his songs. He risked overthinking, but the extra effort pays off. I can't tell you what my favorite song is yet. There might be a "Waterloo Sunset"-level masterpiece among them. Some will miss that shambling Kinks style. Ray's brother Dave was a guitarist of little technique and a lot of attitude. The skilled session musicians on the new one, aided by digital recording technology, come up with a much different sound — more rhythmic, more soulful, more American. Davies' vocals are strong and, as in his best Kinks music, very human. "Other People's Lives" is not to be missed. I asked "Will There Be Flowers?" in Borrego Springs this March. I didn't make it out there, but apparently there is only a limited bloom due to the late-arriving rainfall. Things are a little more colorful in Death Valley. North of Los Angeles, the California Poppy Reserve is flourishing, and probably worth a trip. Check this site for desert wildflowers sightings throughout the desert southwest. Hee Seop Choi is on the Red Sox's disabled list. His Dodger replacement, Nomar Garciaparra, looks like he's heading there, too, along with another new Dodger Codger, Kenny Lofton. To paraphrase Earl Weaver, Ned Colletti just got a lot dumber, and a lot closer to his injury snake-bit predecessor, Paul DePodesta. The Tunguska meteor theory of global warming hasn't picked up much traction, although one of my commenters endorsed it. I'm not sure if I even endorse it! But I like asking questions. Nobody's bought the former Knight-Ridder newspapers that McClatchy put up for sale, but bids are coming in, including a combined bid from the Newspaper Guild and Ron Burkle's L.A.-based Yucaipa investment firm. Blogging turns out to be a good way to connect with old friends and forgotten enthusiasms. I wrote about the history of Elliot Mintz, spokesman for Paris Hilton and, before that, John Lennon, and got lots of great memories of 60s and 70s radio lore in the comments area. This blog has put my family and me back in touch with several long-lost friends — what could be more gratifying? People my age are starting to finally live their dreams, to rethink their careers, and to cherish the good health of their loved ones. It's also been wonderful to hear from other bloggers whose work I greatly respect, and from my fellow denizens of the greatest site on the whole Internet, Dodger Thoughts. Your kind words about this site mean so much to me. Back in December, I started this blog with a somewhat dramatic, breathless recounting of the last three weeks of my last job — including a ferry ride across an icy lake that struck me as symbolic of my situation. In that post, I mentioned that, shortly after I lost that job, I was indicted. Now, 15 months later, I finally get my trial, starting tomorrow. I've gotten so many wonderful notes of support and good wishes, and I'm so grateful for them. Many of these notes say something to the effect of, "You must be so stressed out." Well, the adrenaline is certainly pumping; I'm highly alert. But, no, I'm not stressed out. I'm a fortunate person. I have an amazing wife, a wonderful son, a brilliant and supportive family, and so many great friends. And, I believe our justice system ultimately will be fair. During the trial, which will last about four weeks, blogging here will be light. There might be a guest comment or two. I'm not going to use this site to address my case while it is going on. If I do post, it will be the usual stuff I write about. Whatever that is. Matt Stone and Trey Parker are the greatest satirists of our era, and like the true satirists of centuries past, they are essentially conservative, in the classic sense of the word. Whatever is new, trendy, popular, wherever they find complacency or conventional wisdom — that's where they attack. Some non-classic conservatives have embraced them (there is actually a book entitled "South Park Conservatives") as allies, but the Stone/Parker version of conservatism has no more respect for the religious right or neocon policies than it does for liberal pieties. It was two liberal sacred cows that got savaged in this week's South Park: Hybrid vehicles — or to be specific, the pompous vanity of some hybrid owners — and the city of San Francisco. As Kyle discovers, not only does everyone in San Francisco drive a hybrid; every time a San Franciscan passes gas, they bend over and take a big whiff of it. In one scene, Kyle's father offers a party guest a choice of wines, but the guest only wants a empty glass, which he proceeds to position behind him. He lets one rip, brings the glass up to his nose and inhales deeply. The children of San Franciscans are so repelled by their extremely self-satisfied parents, they have no choice but to take drugs in massive quantities. As ridiculous as some San Franciscans might be, in the next few weeks there will be many opportunities to worry about their fate. April 18th is the 100th anniversary of the great 1906 quake and fire. A nearly 300-mile rip along the San Andreas Fault that, in a matter of seconds, shifted one part of California up to 24 feet, the quake has had no parallel in California since then. The only U.S. comparison in immediate memory would be Hurricane Katrina's massive devastation of New Orleans. In terms of loss of life, it was about the same as 9/11. Since 1906, the Bay Area has been relatively fortunate. The 1989 Loma Prieta quake was a major, catastrophic event, but nowhere near as powerful or widespread as '06. But Loma Prieta was the first major quake to hit S.F. since 1911. By comparison, as this USGS chart shows, there was a relative flurry of large and damaging smaller quakes in the area. From 1836-1911, there were eight quakes of magnitude 6.5 or higher. This month's American Heritage magazine has an essay written by former U.S. Geological Survey official John Dvorak. He takes us on a walking tour of San Francisco and looks for traces of the pre-1906 city, the quake's damage and, chillingly, the areas most likely to suffer massive damage in the next big one. I hurry west along Washington Street three more blocks, passing the dazzling white Transamerica Pyramid, the most distinctive building in San Francisco’s skyline, and reach Montgomery Street. At last I am standing on firm ground. Montgomery Street, often called the financial center of the West, roughly follows the original shoreline of San Francisco Bay, which ran close to the base of Nob Hill. The six blocks from here to the current waterfront are all “made” ground, land literally manufactured by filling the bay with sand, garbage, rotting trees, and other detritus. Scores of abandoned wooden ships were scuttled and lie beneath this section of San Francisco. Made ground is loose and unstable. It takes on the character of a liquid when shaken, such as during an earthquake. Imagine standing on a pile of loose sand. Shuffle your feet back and forth quickly. They sink into the sand. The same thing happens when the ground shakes around a building that is not set on firm ground. Most of the destruction and the five deaths in San Francisco caused by an 1868 earthquake, which originated across the bay in Hayward, happened here. Extensive damage also occurred here in 1906, as well as in other areas of the city built over made ground. The City Hall, then at the corner of McAllister and Larkin Streets, had been built on shaky underpinnings—the site of the city’s first cemetery. The 1906 City Hall was the grandest and largest municipal building on the West Coast. It took more than 20 years to build and only two minutes to collapse. Today the main branch of San Francisco’s library occupies the site, housed in a six-story building that looks more like a bunker than a municipal ornament. Its inside is braced with steel rods and girders, some set at inconvenient angles. At the main entrance, inside a glass case, are artifacts, including bottles, broken chinaware, and a wedding ring. For 30 years I have walked the streets of San Francisco, taking photographs. My goal is to document the city before the next major earthquake. I have often wondered how San Francisco will look after that. Which buildings will fall and which will still be standing? The South Park parody of San Francisco is dead-on, but the other side of all that city's silliness is that its people know, at least subconsciously, that their idyllic home is in the path of nature, and that they could someday be required to act as heroes to save their neighbors and their beloved, smug, self-satisfied metropolis. And we know that's what they'll do. San Franciscans are tenacious and loyal to San Francisco above all. It's interesting to note that America's two most beautiful cities (New Orleans being the other) are also its two most perilous. Is it beautiful in those places because they are so close to nature's unfathomable power? Or does their beauty assure they will survive even the deadliest blows? Another good post on Science Blog, which I just stumbled across today: A report on a controversial new theory to account for global warming. We had a hut by the river with my brother Chekaren. We were sleeping. Suddenly we both woke up at the same time. Somebody shoved us. We heard whistling and felt strong wind. Chekaren said, “can you hear all those birds flying overhead?” We were both in the hut, couldn’t see what was going on outside. Suddenly, I got shoved again, this time so hard I fell into the fire. I got scared. Chekaren got scared too. We started crying out for father, mother, brother, but no one answered. There was noise beyond the hut, we could hear trees falling down. Me and Chekaren got out of our sleeping bags and wanted to run out, but then the thunder struck. This was the first thunder. The Earth began to move and rock, wind hit our hut and knocked it over. My body was pushed down by sticks, but my head was in the clear. Then I saw a wonder: trees were falling, the branches were on fire, it became mighty bright, how can I say this, as if there was a second sun, my eyes were hurting, I even closed them. It was like what the Russians call lightning. And immediately there was a loud thunderclap. This was the second thunder. The morning was sunny, there were no clouds, our Sun was shining brightly as usual, and suddenly there came a second one! Me and Chekaren had some difficulty getting under from the remains of our hut. Then we saw that above, but in a different place, there was another flash, and loud thunder came. This was the third thunder strike. Wind came again, knocked us off our feet, struck against the fallen trees. We looked at the fallen trees, watched the tree tops get snapped off, watched the fires. Suddenly Chekaren yelled “Look up” and pointed with his hand. I looked there and saw another flash, and it made another thunder. But the noise was less than before. This was the fourth strike, like normal thunder. This was the “Tunguska event.” The scientific near-consensus is that it was caused by the airburst from a meteorite, comet or asteroid hurtling toward Earth, exploding 6-10 kilometers above the surface. It destroyed, among other things, 60 million trees. But it left no crater, which indicates the object exploded into flaming dust before impact, releasing 10-15 megatons of energy into the air. The skies above Europe glowed at night for several evenings afterward — bright enough to read by. (T)he most potent greenhouse gas is water, explains Shaidurov and it is this compound on which his study focuses. According to Shaidurov, only small changes in the atmospheric levels of water, in the form of vapour and ice crystals can contribute to significant changes to the temperature of the earth’s surface, which far outweighs the effects of carbon dioxide and other gases released by human activities. Just a rise of 1% of water vapour could raise the global average temperature of Earth’s surface more then 4 degrees Celsius. As such, Shaidurov has concluded that only an enormous natural phenomenon, such as an asteroid or comet impact or airburst, could seriously disturb atmospheric water levels, destroying persistent so-called ‘silver’, or noctilucent, clouds composed of ice crystals in the high altitude mesosphere (50 to 85km). The Tunguska Event was just such an event, and coincides with the period of time during which global temperatures appear to have been rising the most steadily – the twentieth century. Shaidurov’s theory, of course, flies in the face of the more widespread view that the Industrial Revolution of the past 200 years, during which human society unleashed tons of carbon dioxide from the burning of fossil fuels, has triggered the global warming that most scientists believe is underway. Shaidurov says, however, that global temperatures were trending downward prior to a period between 1906-09, a few years before the explosion. It seems strange to me that an event of this magnitude is mostly known only to science fiction and “X Files” fans. Undoubtedly, this is due purely to the remoteness of this part of the world. If such a thing had landed in Ohio, or Paris, our society would be very different. The memory of such a trauma would reverberate across generations. Whether or not Tunguska can be blamed for global warming, the event demonstrates that nothing can change history faster than a random chunk of debris from outer space. I’ll leave to another day the policy impact of Shaidurov’s theory. If this is the cause of global warming, can it be reversed? Will the earth’s upper atmosphere “right” itself, given time? Will Kyoto-type programs help? Geological history certainly suggests that the 5,000 years or so of Earth’s history during which mankind established civilizations and evolved technology has been a period of atypically good weather. Is our luck about to run out? Can our technology help us adjust to what might be an inevitably transformed environment?